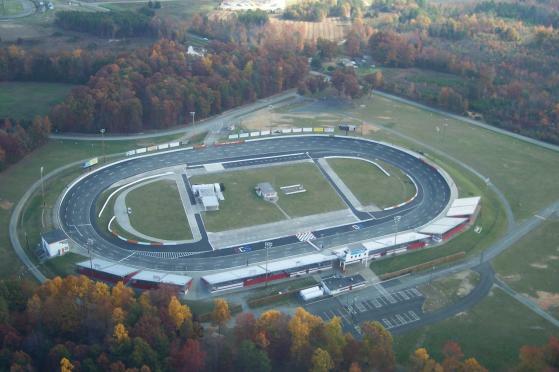 Orange County Speedway is a 3/8 mile (0.6 km) asphalt oval in Orange County, North Carolina, near Rougemont. It first opened in 1966 as 1/4 mile (0.4 km) and 5/8 mile (1.6 km) dirt oval (Trico Speedway), which operated until 1967 and 1973, respectively. The facility was reopened and paved in 1983. With a slogan of "the fastest 3/8-mile race track in America," the oval features 19 degree banking through the turns and 16 degrees on the straightaways creating three distinct grooves making for very fast turns. The aluminum grandstands stretch from Turn 4 all the way down the front straightaway to Turn 1. The speedway closed in 2003, but reopened on March 11, 2006 as an American Speed Association member track. Races from Feb - Oct.